The Bank of America® Cash Rewards credit card’s $200 bonus offer and 3% cash back is the best deal the Credit Card Experts team has seen. If you sign up online today you can receive a $200 online cash bonus after spending only $500 in the first 90 days of opening the account. That is an unbelievable 30% back on the first $500! The card offers an amazing 3% cash back on your choice of six categories and 2% at grocery stores and wholesale clubs (up to $2,500 in combined choice category/grocery store/wholesale club quarterly purchases), and unlimited 1% on all other purchases. This is a brand new feature where you choose the category you want to get 3% cash back for, and it stays on that category until you change it. Unlike other high cash back cards, there is no monthly activation required, and the categories don’t rotate. You can change the category once per calendar month. The 3% for online shopping is one of the best in the industry. It applies to all online retailers. I personally love getting 3% back each time I shop online. Getting 3% back for drugstores is perfect for families that buy a lot of household goods and medication. And of course, 3% back for gas is great for the daily work commute and for summer-time road trips. 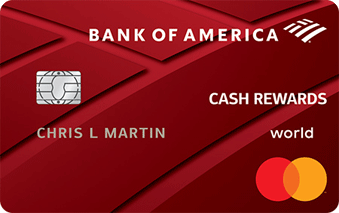 Bank of America® Cash Rewards credit card is a great fit for most people. I mean, who in the world doesn’t love an easy $200 bonus, 0% interest for a year, and no annual fee? The high 3% cash back on online shopping, drug stores, dining, travel, furniture, or gas is unheard of for a no annual fee credit card. Bank of America Cash Rewards pretty much blows its leading competitors out of the water. » Click here to learn more about the easy $200 bonus offer and getting 3% cash back on online shopping. *You could earn over $500 in cash back in your first year, when you spend $1,250 a month on a card like this. Here’s how that breaks down. First, earn a $200 cash sign-up bonus. Then, max out the 3% cash back category (up to the quarterly limits) to earn $300 in cash back, plus an additional $50 in cash back (based off 1% on $5,000 yearly card spend). Average yearly spending for Americans totals around $24,927 and includes the average amount spent a year on food, apparel, entertainment, transportation plus the mysterious “other” category, according to the Bureau of Labor Statistics through June 2016. (Food $7,196, apparel $1,794, entertainment $2,908, Transportation $9,225, other $3,804 = $24,927.) Put $15,000 of that on your new card, maximizing the 3% category and you could earn $500 in cash back in your first year including the sign-up bonus.